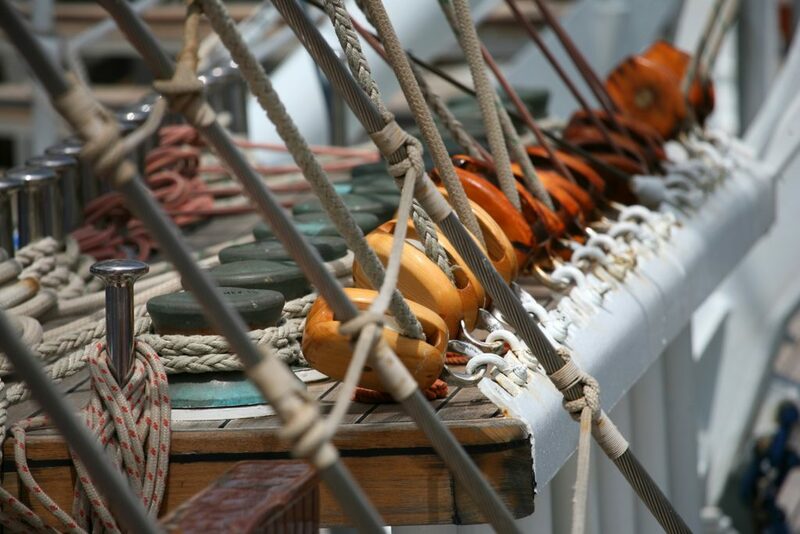 With a collective ‘heave ho’ we tugged on the stout rope in a disjointed fashion and staggered backwards on the gently rolling deck when nothing happened. Above the sound of the waves our team leader shouted that we needed to pull on the ‘ho’ rather than the ‘heave’ so we regrouped and seconds later were rewarded with the sight of one of Royal Clipper’s 42 sails responding to our efforts. It was an awe-inspiring moment to see the staysail gently unfurl and exactly 1 minute and 33 seconds later start picking up the trade winds and propel the ship forward. With another team completing the task in more than double our time, we were duly rewarded with a chocolate cake for coming second in a seafaring Olympic Games that also saw us hunting for spoons in the swimming pool, running around the swabbed teak decks in an egg and spoon race and holding aloft bottles of water for as long as we could. That night we gathered in the al fresco Tropical Bar to continue celebrating our success and deluding ourselves that we were easing any aching muscles with the aid of a Pain Killer, a potent cocktail of rum, brandy, orange juice, coconut cream and nutmeg. It was probably no surprise we slept so well that night; rocked to sleep in our cosy cabin decked out in gleaming wood and brass and with the spray of the Atlantic Ocean washing over the porthole. 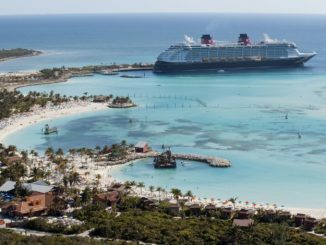 It was all a world away from the stereotypical image of a transatlantic crossing, where thousands of passengers gather on mighty cruise ships to dress up in their best bib and tuckers, dine at multiple restaurants, dance the night away in glittering ballrooms, gamble and watch West End-style shows. 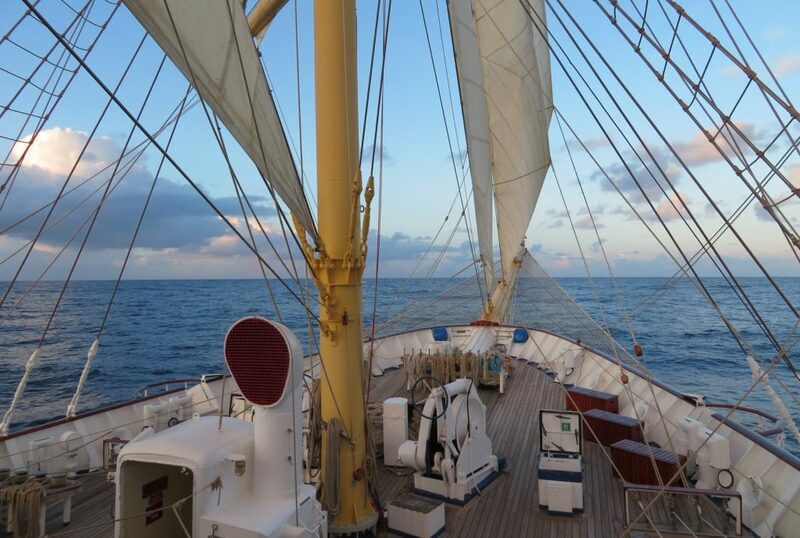 For people who aren’t big on ‘regular’ cruising and adore sailing or harbour a romantic notion to fleetingly run away to sea on magnificent tall ship then Royal Clipper will tick all their seafaring boxes and more. 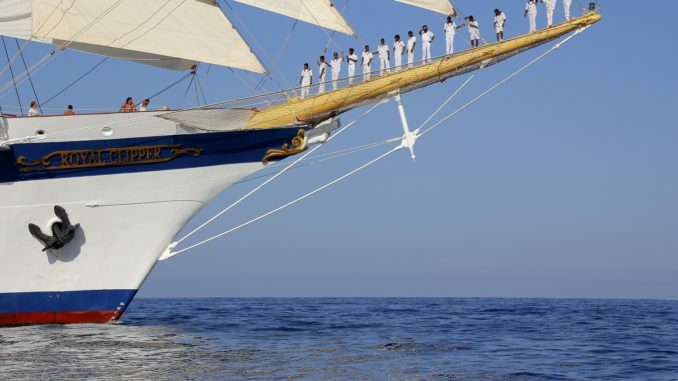 Carrying just 227 passengers, and with a crew of 106, the vessel is part of the three-strong Star Clippers’ fleet which replicate the golden age of sailing with modern day comforts. Flagship Royal Clipper holds the Guinness record as the world’s largest square rigger in service and with 5,202 square metres of sails spread across five masts this classic ship powered solely by wind whenever possible. 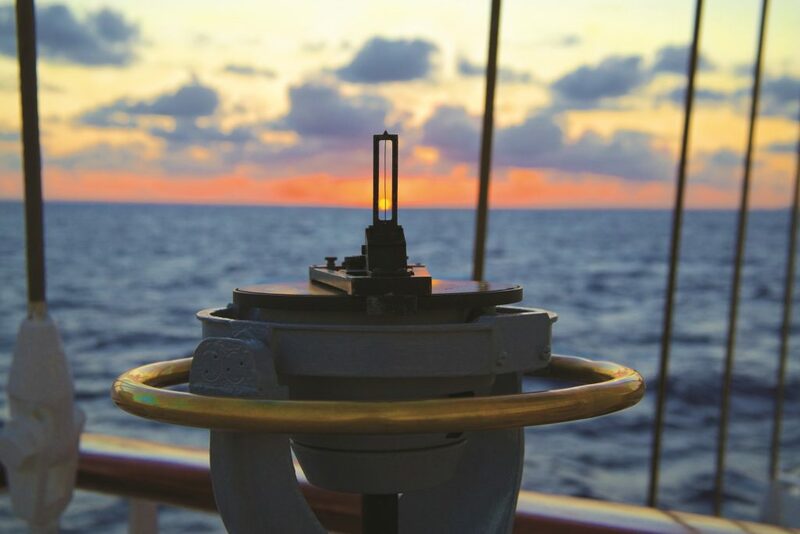 Each day, dot on noon, three bells would sound and Captain Mariusz Szalek updated us on the progress of our 16-day 3,131 nautical mile voyage that took us from Bridgetown, Barbados, to Lisbon in Portugal, with just one stop in the Azores. Unlike large ships, Royal Clipper is very inclusive, and officers and crew mingle with passengers throughout the day and guests are welcome to go on the bridge during daylight hours to chat and ask questions. For the entire trip, and with a visibility of 30 miles to the horizon, we only saw a handful of vast container ships passing in the distance along with four plucky souls crossing the Atlantic on a yacht. Adding to the thrill of sailing in this vast expanse of water were encounters with some of its marine inhabitants – silver shoals of flying fish skimming the surface off Barbados, pods of dolphins swimming alongside Royal Clipper’s bow and the breath-taking sight of a whale with a calf alongside almost simultaneously expelling air from their blowholes. In keeping with such a traditional experience on board activities are low-key, but there was never a shortage of things to do with a daily programme that started with a cobweb blowing early morning exercise session on the open deck and ended with a colourful pirate’s night, crew and passenger fashion show, classical music concert by the resident musician or screenings of historical nautical films. On a particularly memorable night we gathered under the sweeping canvas of the night sky for a star gazing session led by one of the officers. Free from any kind of light or environmental pollution we were transfixed by the stellar spectacle as the officer pointed out Jupiter, the bright Dog Star, plough and astrological constellations of Leo, Gemini and Virgo. Many of us agreed that it outshone any theatrical show that you’d see on a big cruise ship. During the day we tried our hand at knot tying, making the improbably named baggywrinkles that prevent the edge of the sails from chafing on the steel rigging, and listened to insightful talks on navigation. Those with a head for heights could harness up and climb the mast to the first crow’s nest like a professional deck hand. 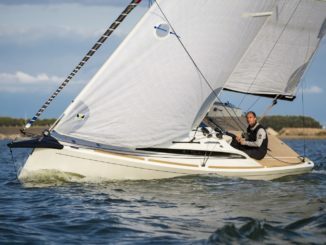 Any initial wobbles are rewarded with the most spectacular views of the seascape, billowing sails and decks 50ft below. Alternatively, head to the opposite extreme and have a massage in the Captain Nemo spa which is below water level with the sea rushing past the portholes. 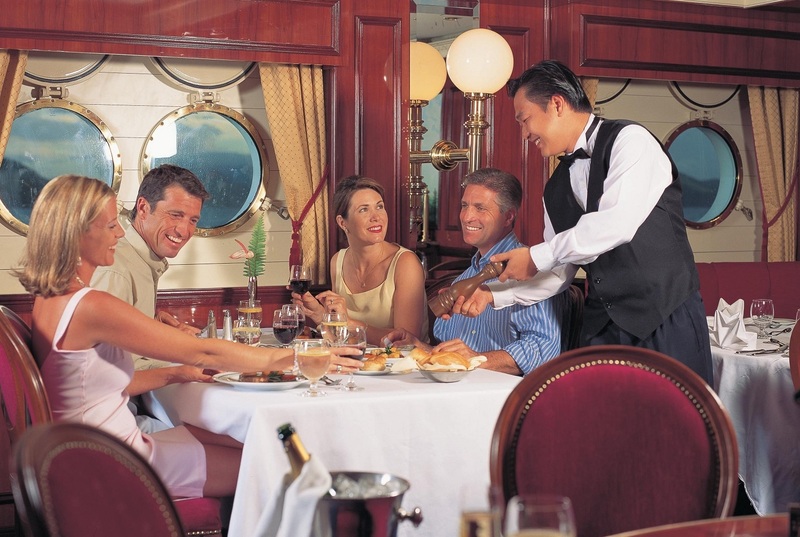 Each night a bell rung around the ship’s corridors accompanied by the call “dinner time” heralding the arrival of another meal, and without any restocking stops en route we were constantly surprised by the array of imaginative spreads that greeted us at breakfast, lunch, late afternoon cocktail hour, evening meal and even a late-night snack. It seemed fitting that we ended the crossing in Portugal, birthplace of some of the world’s greatest navigators, and in a city that has witnessed the arrival and departure of so many illustrious ships over the centuries. With its billowing sails and elegant lines modelled on the Preussen, built in 1902 and the largest and fastest ship of its time, Royal Clipper certainly created a nostalgic head-turning sight as crowds of onlookers lined the quayside to witness our entrance. 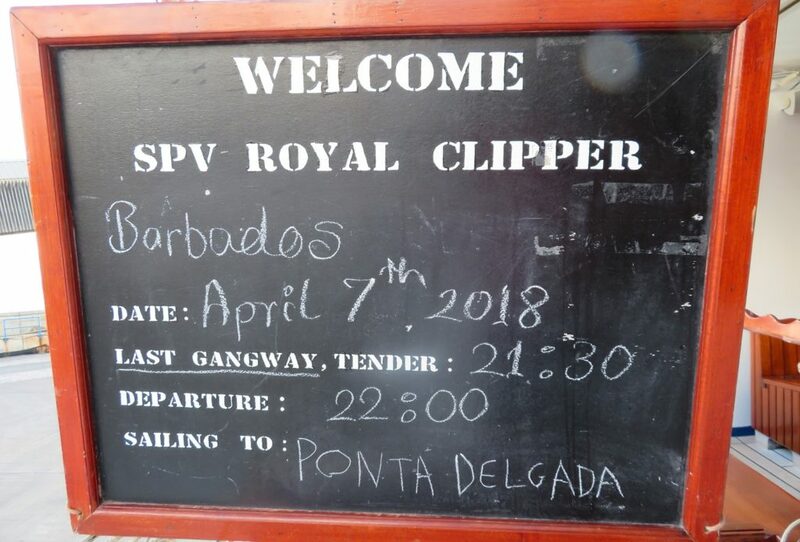 It was an exhilarating finale to a real-life swashbuckling adventure and while the days of press-ganging sailors into ships might be long gone, Royal Clipper is enough to lure anyone to a life on the ocean wave. Number of Cabins: 114 cabins and suites with Wi-Fi available for a fee. Insider Tip: As well as being a great place to relax, the springy bowsprit nets are the best place to spot dolphins which often swim alongside close to the bow. 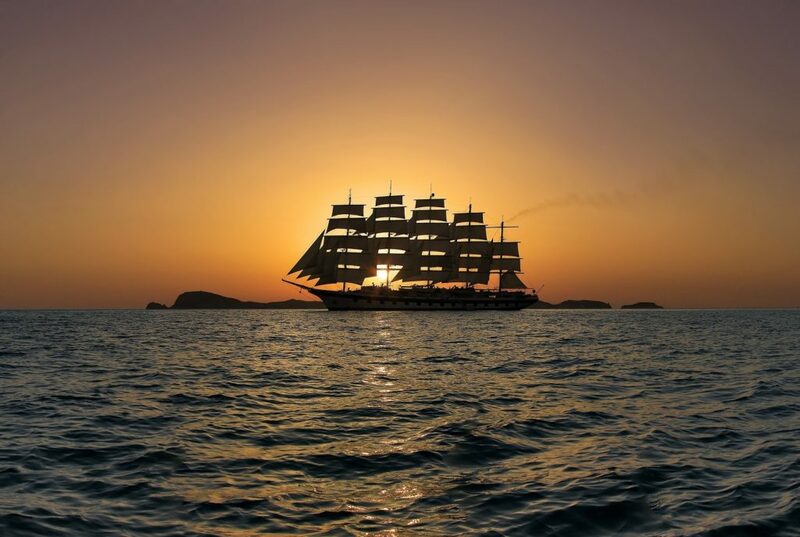 Fact File: Star Clippers offers transatlantic crossings between Europe and the Caribbean, or vice versa, on Royal Clipper and the 170-passenger ship Star Flyer. The 20-night St Maarten to Malaga eastbound passage on Star Flyer departing 30 March 2019 is from £1,590pp and the 15-night Las Palmas to Barbados westbound crossing departing 8 November 2019 is from £1,545. The 16-night Lisbon to Bridgetown westbound passage on Royal Clipper departing 31 October 2019 is from £1,660pp and the 16-night eastbound return sailing between the same ports departing 4 April 2020 is from £1,580pp. Fares include all meals and snacks. 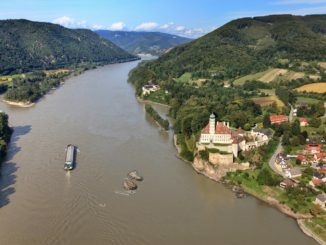 Known as the ‘River Cruise Queen’, Jeannine Williamson is an award-winning travel writer, cruise expert and our cruise correspondent, who has clocked up thousands of nautical miles.